When an ordered filled, a notification will be good to follow up. This morning I became aware of a new feature from my bank with my mobile banking app. On my home screen, when my phone is asleep, I can set up a “quick pay” widget. If I select it, it quickly scans my fingerprint to log in and then opens my banking app to scan a QR code for payment. 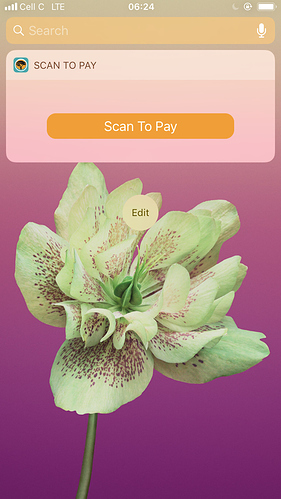 This is a way to do cardless payments and very convenient. Each individual waves account needs to have this settings enabled on the device so you can choose what wallet allows this. A limit is set for transactions by user . So for example only 10 waves max per transaction. Restrictions to what tokens can be used for quick pay. For example, waves only, or a list of pre-approved tokens the user has defined. We are already planning something similar for our users. Awesome! I wish more apps would support this scanning. A search function in the wallet tab like there is in the desktop client. The invoice link’s priority needs to be set to the mobile wallet and not the web client. Most people use the Mobile wallet instead of the web client. It would really be great if you can add that feature to the app. The sponsorship for send transactions, at least in the iOS App, should not default to Waves if there are no Waves in the wallet. Currently a message pops up that you don’t have enough funds to pay fees for the transaction. It should default, in my opinion, either to using the asset you are sending, if it’s a sponsored asset, or to the asset you have the most of that is a sponsored asset - this way you can send without getting an error message. This would make the sending process more seamless for the (less sophisticated) user using sponsored transactions. We use Waves platform for community alternative currency. The community token can sponsor transactions but when users go to send the token they get the message they don’t have enough funds - even though they have enough of the fee (community) token. It would be good if this error didn’t appear and confuse people. Is there a plan to make Waves invoices able to be opened in smartphone apps? If I send an invoice by text to someone they can only open it using the web interface it doesn’t open using their installed Waves app. Yes. It is in our pipeline.